What Do Environmental Consulting Firms Do? Are you considering an industrial or commercial venture in the Cleveland or Northeast Ohio area? If a property investment action is on your radar, your task list will include managing environmental risk. This is where a partnership with an environmental firm is essential. These companies minimize your environmental risk and maximize your investment. The firm will partner with you to develop and implement environmentally responsible business practices. Their solutions should include everything you need to address all environmental concerns as well as turn your waste streams into revenue streams. To do this, a comprehensive environmental consulting firm offers the following services. As part of their due diligence, the firm identifies potential contamination issues and traces their history to the responsible parties. The detailed assessments and reporting include on-site reconnaissance, personal interviews, and thorough research of the property’s historical information, past and current issues, and adjacent properties. The completion of these services protects you and your company from potential lawsuits or fines related to environmental concerns. Disposal costs can eat away at a company’s bottom line. An environmental consulting firm will help you reduce costs associated with waste management and disposal. These experts can also help you transform cost-draining waste streams into revenue streams. Thus, their input can provide a trifecta of benefits as they extend the life of landfill space, reduce disposal costs, and develop new sources of revenue. Additionally, the firm will ensure your company meets all regulatory requirements regarding waste. The right permits are essential to a successful project. As you begin your endeavor, you must determine what, if any, environmental permits are necessary to proceed. An environmental consulting firm offers the required expertise to handle the permit application process and complete all the steps needed to obtain permits and maintain compliance during the project. This includes an in-depth understanding of current regulations and permitting requirements and a positive relationship with local governmental bodies and regulatory agencies. Many projects throughout Ohio require asbestos evaluations and abatement. An environmental consulting firm offers trained professionals to provide asbestos services. They will ensure your project aligns with EPA regulations and best practices, which includes thorough and professional reporting. The Bureau of Underground Storage Tank Regulation (BUSTR) maintains certain requirements of property owners to address contamination and protect groundwater resources. An environmental consulting firm remains up to date on all requirements related to BUSTR and works with you to assess subsurface conditions related to underground storage tanks. The firm will provide site reconnaissance, UST removal, site investigations, and remediation plans. Their efforts will ensure your project remains BUSTR compliant. Not every environmental consulting firm can perform these comprehensive services. As you consider your options, look for a company that will meet your needs from initial assessments, to project completion, to ongoing compliance. 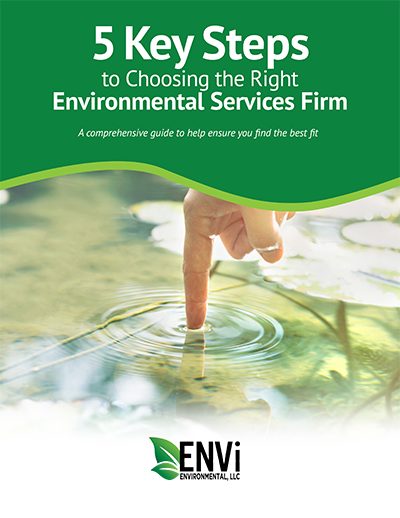 Choose a firm that is proficient in all areas of environmental risk and waste management so they can provide seamless services to solve your environmental objectives effectively and efficiently. What do environmental consulting firms do? Some offer certain services. ENVi Environmental does it all. With more than 30 years of experience, ENVi Environmental is the premier environmental consulting firm in Cleveland, OH. ENVi Seamless is ENVi Environmental’s suite of services that includes all environmentally-related offerings, from evaluation and assessment to abatement or remediation. Our ENVi 360™ Solution covers the full spectrum of environmental services to meet the needs of complex projects from start to finish. Contact our team today to find out more about our environmental services and how they can benefit your business.